Área Venta: TERRITORIO PENINSULAR ESPAÑOL, PARA OTROS DESTINOS CONSULTAR PRECIO. TERRITORIO PENINSULAR ESPAÑOL, PARA OTROS DESTINOS CONSULTAR PRECIO. COMPRESOR ABAC PRO A39B-200 CM3. 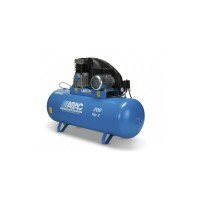 COMPRESOR ABAC DE 3 HP CON DEPOSITO DE 200 LITROS MONOFASICO, PERO CON UN AIRE ASPIRADO DE 393 L/M. LO QUE NOS PERMITE TRABAJAR CON PISTOLAS DE IMPACTO DE HASTA 3/3 DE PULGADA. SE SIRVE CON RUEDAS PARA UN TRASLADO MÁS COMODO. IDEAL PARA TALLERES EN BAJOS COMERCIALES QUE NO DISPONEN DE CORRIENTE TRIFÁSICA.